Not the type that is solely intended to go from point A to point B. Commuting stuck in traffic has zero appeal. I’m talking about the type of driving with miles of open road, good music on the radio, and time to refresh my head. I find it extremely therapeutic. It’s a chance to unwind, to think, and to see the world. Whenever I get the chance to take a few days on the road, I’ll do it. That’s why when I was asked to go to Seattle for work last month, I left a few days early and rented a car. A weekend on the road was exactly what I needed. One goal I have, as a result of liking to drive, is to visit every county in the United States. It’s ambitious, and it’ll probably never happen, but it tricks the analytical side of my brain into playing along with the creative side which takes the pictures. Planning the drive becomes a fun optimization problem, and it makes sure that I can see something new. As a result, my route for the weekend was planned well in advance, shaped to get as many new counties as possible. The drive would start at the SeaTac airport, go eastward to Missoula, down to Lewiston Idaho along US 12, then across southern Washington and northern Oregon along the Columbia River. The last bit would take me up to the Olympic Peninsula, then loop back to the SeaTac on Monday morning before an afternoon work meeting. I had two days, plus the night before and morning after, to drive over 1600 miles. It was ambitious, but doable with some effort. The drive started out well enough. I flew from Boston to Seattle on Friday after work and set off immediately. I had hoped to sleep on the plane and didn’t, but still managed to drive about 100 windy, raining miles, late at night with my internal clock still on eastern time. I eventually slept in the back seat of my rental Chrysler 200 in a rest area near Ellensburg, Washington at about 12:30AM local time. It was my goal to get there if I could, because that would make my task over the next few days a bit easier. My goal for Saturday was to make it to Lewiston, Idaho. In a straight line from the rest area, it would have been an easy 250 miles. However, when going by way of Missoula (with a few detours for extra counties), I had nearly 700 miles ahead of me. Fueled by terrible rest area coffee, McDonalds breakfast, and county-counting ambition, I set off at about 7AM. It was overcast, which wasn’t a surprise. The rain from the previous night was lingering, but the sun was supposed to break out of the clouds somewhere over the central Washington desert, and the rest of the day was supposed to be perfect for photography. It wasn’t. As I set off to the east, the overcast skies began to dissolve into high clouds, with some patches of blue sky filtering through. Right on schedule! However, there was a lingering brownness on the horizon, getting ever larger as the miles ticked by. The sky kept encroaching on the car. Visibility reduced. At first, I thought it was smoke. I knew that a significant portion of the Pacific Northwest was on fire, but I didn’t know the specific locations. I did know that, as of my landing in Seattle, all of my planned route was still open. As visibility continued to worsen to 100 feet or so, I began to wonder if there were flames creeping up on I-90. Something was off; it didn’t smell like smoke. Breathing was difficult, but eventually it became clear that the cloud was something different. After a few minutes, a severe weather warning on my phone confirmed: it was a dust storm. I had never seen something like this before, nor was I expecting it. Dust storms are relatively common in this area, even though mentally I associate them with Arizona more than Washington. I was concerned that visibility would soon drop to zero. However, as I continued eastward, the dust began to subside. The sky was still obscured, but visibility improved from 100 feet to about a mile. After some scary moments pushing through Spokane’s urban sprawl, I was able to start escaping the storm once again. I was excited - the forecast showed that the dust would subside, then I might finally have some clear skies. Interstate 90 in eastern Idaho and western Montana is quite beautiful, and it would be a welcome respite from the interesting but hazy photos from the morning. As the road ascended into the mountains, the dust indeed began to subside. I could breathe again! Finally, fresh mountain air. However, the promised blue skies were still not there. Instead, the sky turned white, and, eventually, rain began to fall once again. Yes, all of these pictures have been taken while driving. With weather like this and many miles left to drive, it’s hard to be motivated to get out of the car. For what it’s worth, I don’t try to compose while I drive (that’s what photoshop is for), I don’t adjust camera settings in motion, and I always keep at least one hand on the wheel. It’s safer than it looks. This portion of the drive was actually quite fun, and I finally got the chance to turn the rental car loose in the drier sections of road. It was invigorating, even though the photos were still bad. At the summit of the pass between Idaho and Montana, I took a break to stretch. The rain had stopped, and the sun was threatening to breach the clouds. The descent into Montana’s western plains was looking to be photogenic. However, there was another problem. As the road wound downwards, the sun disappeared right as it came out. Much like in the morning’s dust storm, the air became thick. The sky turned a sickly mixture of red and brown. The smoke had found me. At this point, I was 500 miles into the trip. My mood was despondent - 500 miles and not one photo opportunity in good light. The lack of sleep was starting to catch up. Lewiston was still the planned destination, but it was starting to seem doubtful that I would be able to make it, to the point where I began to research hotels further up the road. However, seeing “Lewiston” on a sign for the first time raised morale (so would the “all day party” advertised on the bar’s sign, but time was of the essence). So did the idea of the road I was about to drive down. US Highway 12 between Lolo and Lewiston is considered one of the most scenic stretches of road in the country. It roughly follows Lewis and Clark’s path from over 200 years ago (hence the name Lewiston). The highway ascends Lolo Pass to the Idaho border, then follows the Lochsa and Clearwater rivers closely for over 100 miles before meeting with a larger network of roads on the northern end of the Nez Perce Reservation. This road is what I came for. There was reason to be optimistic, too. 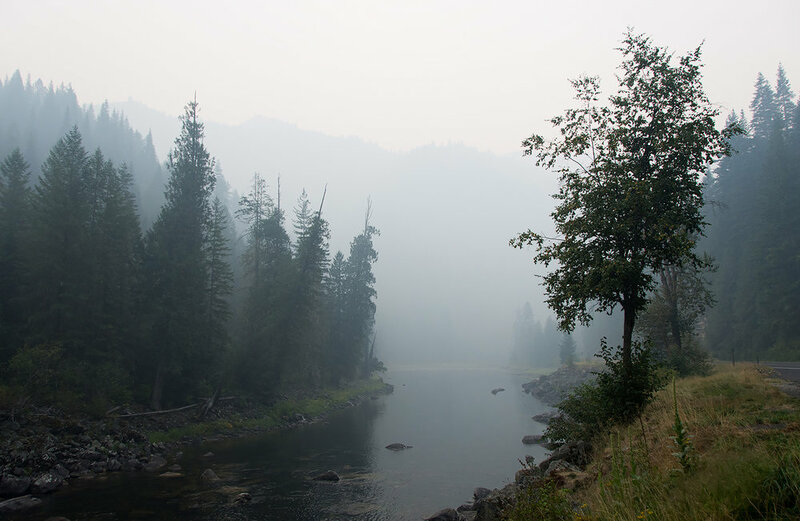 The smoke that I was stuck under only began in Montana, and I had hoped that going over the pass back into Idaho (only 14 miles away) would help to contain it. The dust storms from that morning had subsided, too, so that wasn’t a concern. If it was less smoky, like I had hoped, then I’d finally have the conditions that I was so desperately hoping for, and the best road of the bunch to enjoy them on. It was drizzling a bit on the fire, and firefighters were not actively working on this particular flare-up, instead trying to keep it on the south side of the river. Other than trying to keep the road open, they were letting nature run its course. No structures were threatened by this particular branch, and it was caused by a lightning strike. This was a part of nature, the circle of life, as were the issues with air quality earlier in the day. This led to a revelation: the smoke, the dust, everything earlier in the day – it wasn’t what I had planned for, but it was still nature being amazing. I was frustrated because the photos I was taking weren’t what I wanted, but I wasn’t looking at the day with the correct frame of mind. After stopping to take photos of the fire, I continued westward, still about 150 miles to my destination. As the road wound through the canyon, visibility slowly improved. The sun! Pink, peering through the smoke. For the second time in the day, it was making an appearance. And what an appearance it was! The next half hour was spent alternating between driving and pulling off to take more photos as the sky started to clear. That whole day, the frustrations caused by the endless obstacles between me and the sun, it was all worth it. I never quite got the perfect shot of the sun filtering through to the smoke-filled valley, but it didn’t matter. I was happy. As dusk approached, the smoke began to thicken once again. 50 miles down the road, a fire threatened to close US12. A closure at this point would have sent me over 100 miles back towards Missoula, since there would have been no way around. After waiting for over 20 minutes at a temporary road closure, I was finally let through. After all of the trials, I eventually made it to Lewiston for the night. The following day was also mostly cloudy (though with better air quality). Still, the lessons I had learned on this day, the Day of Many Pollutants, carried me through. You never know when the sun will break through the smoke.